The island of Blue Dolphins lies in the Pacific, somewhere off the Hawaiian islands. The island is so named because it resembles the shape of a dolphin lying on its side. On this little island, there lived a tribe of Indians, peacefully organizing themselves into a society subsisting on the marine life. But even this little island of harmony was not spared of conquests and invasions. After a battle that wiped off many of the men and leaders of the tribe, the new leader began to explore the seas to search for another land - the land of the “white men”, near the California coast. A ship is sent for his entire tribe to join him near the coast of Santa Barbara. Unfortunately, one girl of twelve, Karana, jumps off the ship to get her younger brother who was left behind. All alone in the entire island, she bravely awaits the ship to return for many years. This is a cast-away story of a girl who cleverly survives on her own - armed with her shrewd weapons, courage, hope and some loyal animals. Every time I pick up a book honored with the Newberry Medal, I feel how much I wasted my younger years reading happy, fun, fantasy, fairy-filled, la-la stories. Entering adulthood was all the more sudden and harsh for those of us who were not introduced to heavy concepts - such as survival, the hardships surrounding it, the decisions confronting it, and the principles that help with addressing all of it. It makes sense to slowly inject these issues into young minds, to start the process of thinking, questioning, and informed understanding. When I started reading the book, I was extremely skeptical of this being a children’s classic. I expected happy magical dolphins and sea creatures that help the girl out (how amusing, I know). But through the course of the story, as tragedies and pitfalls were balanced with determination, optimism and compassion, I conceded that this was indeed a fitting story filled with lots of thought-provoking moral principles for children. This is a story without adornments trying to add happy frills to a tough situation - it relates the story as is, but in such a way so as to not overwhelm children with grief or anxiety. Karana is written as a strong and clever girl who creatively and constructively combats her loneliness and pursues her quest to survive. 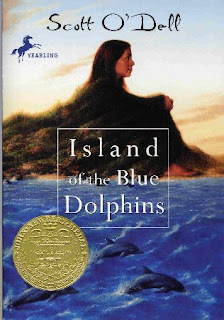 I particularly liked how the author balances the ruthless spirit of survival with tenderness, kindness, and compassion. Even though one is driven to defend oneself by killing other creatures, the story brings the message that one has to draw a line to make sure that the spirit of humanity is not lost to barbarism. The story shows the rewards of compassion, friendship and loyalty to animals, and their importance in our lives. The writing flows well and takes the bitter edge off the theme of survival. Perhaps as an adult, I wished for more emotions in the words, but on second thoughts, I think it is best that children not be choked with heavy emotions on a heavy topic. The book is surely worth its adulation as a children’s classic.